Lucknow/New Delhi/Kolkata, Feb 12 (IBNS): Several opposition leaders, including West Bengal CM Mamata Banerjee and her Delhi counterpart Arvind Kejriwal, came out in support of Samajwadi Party leader Akhilesh Yadav after he alleged that he was prevented from boarding a plane at Lucknow airport. Akhilesh was about to attend a programme at the Allahabad University Students' Union on Tuesday afternoon. 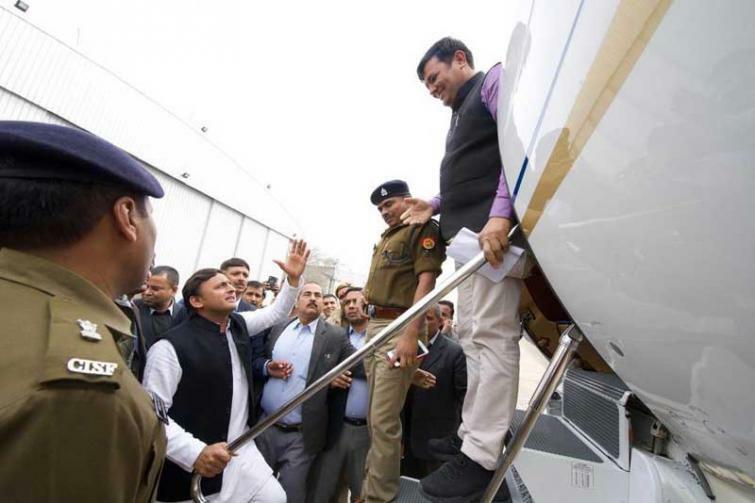 Akhilesh took to Twitter to say, "I was prevented from boarding the airplane without any written orders. Currently detained at Lucknow airport. It is clear how frightened the govt is by the oath ceremony of a student leader. The BJP knows that youth of our great country will not tolerate this injustice anymore!" Mamata Banerjee and Arvind Kejriwal attacked BJP over the incident. I've already spoken to @yadavakhilesh. We all condemn the arrogant attitude of the so-called #BJP ‘leaders’ who didn't allow Akhilesh to address the students. Even @jigneshmevani80 was not allowed. Where is the democracy in our country? And they are giving lessons to everybody! Banerjee tweeted: "I've already spoken to @yadavakhilesh. We all condemn the arrogant attitude of the so-called #BJP ‘leaders’ who didn't allow Akhilesh to address the students. Even @jigneshmevani80 was not allowed. Where is the democracy in our country? And they are giving lessons to everybody!." Kejriwal said: "Spoke to Akhilesh ji. We strongly condemn BJP’s conduct. This is yet another example of BJP’s dictatorial attitude." The SP leader was about to be present at the oath-taking ceremony of the students' union in the Allahabad University. The student wing of Akhilesh's party is presently holding the president's post of Allahabad University Students' Union. However, the Allahabad University had reportedly told Akhilesh's personal secretary that politicians are not allowed for any event in the university. Bahujan Samaj Party (BSP) supremo, Mayawati, who will fight the 2019 General Elections in an alliance with the SP, called the incident "undemocratic" while attacking the BJP government. "The incident of stopping Akhilesh Yadav from going to Allahabad by preventing him to board plane at the Lucknow airport is condemnable and symbolises that the BJP government is anti-democratic," former Uttar Pradesh Chief Minister Mayawati tweeted. The Allahabad police reportedly said the SP leader has been denied to enter the university fearing problems of law and order.